When there are integration points in the processes where a Service-type task is used (to either invoke a Web or REST service or to use custom code for an advanced business rule -though the Component Library), Bizagi allows these types of tasks to be configured for asynchronous execution. 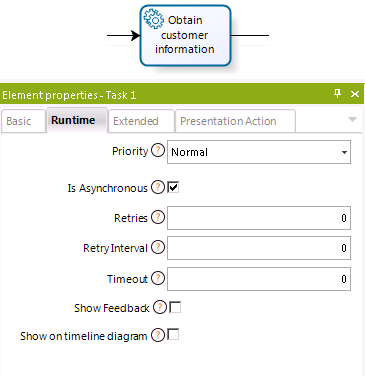 When you define a BPMN service task as an asynchronous activity, Bizagi lets you set a number of retry attempts, in case the activity's integration actions (usually, an invocation to an external service) fail to respond within a given threshold. When an asynchronous activity fails (i.e. an external application' service is not operational, there are connectivity issues, etc) and surpasses the number of predefined retries, Bizagi lets an administrator review, follow-up/diagnose and manually retry such operations. The image above, shows the configuration parameters for an asynchronous activity, as it is defined when you model a process. In the administration options for any asynchronous activities, Bizagi will store a log that records which process instances (cases) failed to complete specific activities. The log records the corresponding an error message. Through this console, most importantly, the administrator can manually retry failed activities. To access this feature, click the Admin menu in Bizagi Work Portal. Click Asynchronous Activities Console in the displayed menu options. This option lets the business administrator decide which Items to retry, individually or in groups, and to view the retry log, and to cancel cases (should this be necessary). You can review a table of all Failed Asynchronous Activities showing information such as: A log with execution details (error message), the case number to which the Activity belongs, the Activity's name, the number of retries so far, the date in which the Activity was first attempted, and the latest retry date. To manually retry an Asynchronous Activity, select the Asynchronous Activities tab and click the icon under Retry now column for the corresponding row. To retry more than one item at once, select the items to be retried in the Asynchronous Activities tab and then click the Enable Asynchronous Activities button. These items will be marked for automatic retry, which is carried out by the Scheduler. Bizagi lets you retry, grouped by Process or Activity, all the items that have failed. This retry is not performed immediately, it is executed by the Scheduler. For this, select the Grouped by Activity tab. Click Enable in the Delegate retry to Scheduler column, to have the the Scheduler retry in batch those grouped activities in batches. You can enable grouped Activities per Process. To see the retry log which has execution details and the error message, click the icon under the Log column. In the Asynchronous Activities Log, you will find the history for the retried attempts' date and specific error messages.